Learnings from Hopi: What Is Your Blue Star? Since 2007 Kenosis Spirit Keepers has been sponsoring Hopi Wisdom Keepers on my spiritual travel programs to reconnect with relations along their migration path from South America. * As much as it’s been spiritually meaningful to them, it’s been an extraordinary privilege for the rest of us on those travels to witness how they find proof in the common symbols, creation stories and even Indigenous language in Peru, Mexico and Guatemala, letting them know—indeed—those were their origins. One of my favorite memories from Peru is when Harold Joseph met Don Miguelito, an Elder who only spoke Quechua. Yet Harold understood him. Another is when the reed serpent-shaped boats on Lake Titicaca excited Harold. He brought a replica home and showed it to his late father-in-law, the last Hopi oral historian of his clan. Char Joseph told me of her father’s response, “It made him so happy! It proved to him that our stories are real!” All Hopis who have come on the Maya journeys as well have made the connection between the Jaguar Twins in Maya traditional stories and their own, along with many other commonalities. When such things happen it supports spiritual grounding. Something intangible finds its inherent slot. It’s part of identity and who we are in the world. For so many of us today, ancestry is unclear… lost to time or hidden. I can easily link my own migrations through this lifetime that have brought me to where I am today. But what about lineage? Mine is a mixed bag. Some can be traced back to the late 1700s through records that tell of my Irish and English ancestors’ wanderings from place to place. However, there’s a good chunk of my heritage only known through veiled family stories or random comments … untraceable. During the first half of the last century, my people were taught to be ashamed of their Native origins and perhaps attempted to pass for something they weren’t. And in earlier years, they were just trying to keep their lives. What we know of our roots and what we don’t commingles and informs the stories we choose to create through the making of our own lives. And we can pay attention to what runs in our blood that needs no proof. Pam Hale Trachta, a spiritual mentor and author of Flying Lessons, participated in my Spiritual Travel to Hopi program in March. She’s written a beautifully informative article that encompasses what I’m writing about here: Hopi migrations and our own guiding light. What Is Your Blue Star? Blue star petroglyph. Photo: Pam Hale Trachta. 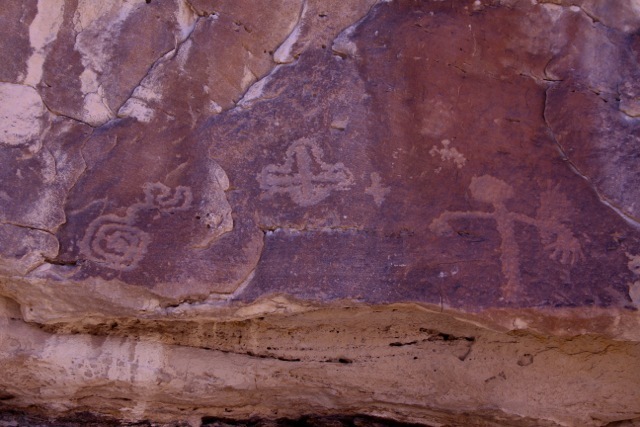 The Hopi people we met in Arizona on a spiritual tour with Carla Woody allowed us to see and photograph a petroglyphic symbol of a blue star that appeared long ago, to signal their way home. The story they told us was that when they emerged through a sipapu or opening in the earth in northern Arizona, they met Masau, the guardian of the earth, who told them they could inhabit this world if they would abide by his instructions…He told them to make migrations into the four directions, and after spreading far and wide he told them they would be signaled back to the place of their emergence… Read more. Pam also wrote about precious time we spent in the Harold and Char’s home. I wanted to include this, too, as added reading to convey how special it is to be invited. Post-ceremony breakfast feast. Photo: Pam Hale Trachta. On a literal level, this feast was prepared for us by Charlene Joseph, a Hopi woman from the village of Moenkopi. We were welcomed into her home to learn about the Hopi way of life, which is all about Spirit. 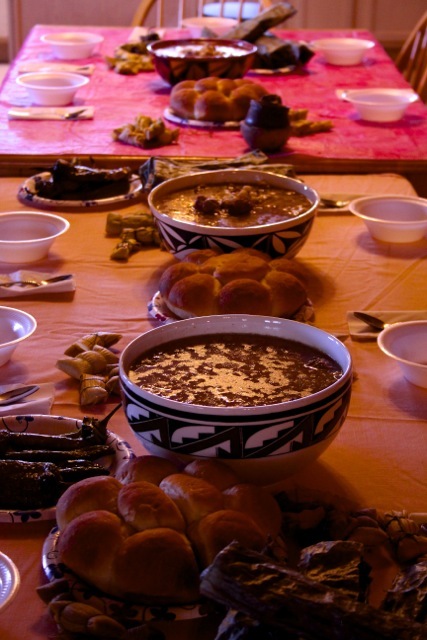 Perhaps you can’t see Spirit in the photograph, but it is the major ingredient–the primary flavor in every event, every “dish” that is part of her family’s life…This feast is a tradition the morning after the night Kachina dances, which we were privileged to attend… Read more. *I founded Kenosis Spirit Keepers, the nonprofit extension of Kenosis, in 2007 to help preserve Indigenous wisdom ways.